Modernly refurbished to a high standard, this impressive building consists of offices and meeting rooms, fully furnished and technologically equipped. 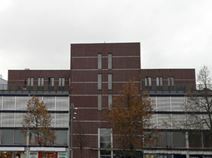 The building is located in the heart of Helsinki and is well served by public transport and is provided with parking facilities. Within the immediate area, there is a vast range of restaurants, cafes, shops, art galleries, museums and performing arts theatres to enjoy outside of work. Close by is a number of parks and gardens, historical monuments and tourist attractions. This centre is located in the Kamppi neighbourhood and provides flexible office-spaces at affordable prices. Spacious meeting rooms, conferencing facilities, a friendly reception and communal areas are all available in this incredibly vibrant work-space. Spanning across three floors, this centre boosts productivity due to its modern design, and the space is accessible 24-hours a day. Easily accessible through public transport, the office building is located in a bustling area surrounded by local cuisine and plenty of bars or shopping opportunities. The Rautatieasema Jarnvags Railway Station is extremely proximate, facilitating easy travel around the city. A wide range of offices will be soon available to let right in the centre of Helsinki. Available in various sizes, these offices are flexible and can be tailored to accommodate any of your requirements. These offices are provided with large meeting rooms, business lounge, an elegant reception area to greet your clients, high quality secretarial and reception services and state-of-the-art technology solutions. They are surrounded by shops, banks, restaurants and numerous amenities. Situated in an important technology centre of a rapidly developing area close to the heart of Helsinki you can find this business centre. A variety of turn-key services are available to tenants who value convenience and quality. This business centre offers flexible offices for the changing needs of your company during its life cycle. Adjusting your space size and layout to better match your company needs is easy. 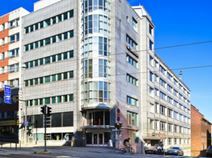 Set within a prestigious district in the heart of Helsinki, this business centre combines modern, refurbished office space with an historic building that is sure to impress clients. At this space, your business will be well equipped with excellent facilities that will ensure productivity, efficiency and success. It is highly accessible from all points of the city. Close by, there are events venues. 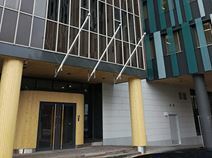 At the heart of Helsinki, with superb transport connections and a shopping centre nearby, this well designed business centre provides contemporary offices finished to a very high-quality, along with a friendly and supportive team. A relaxed yet profeesional atmosphere conducive to good business. Just a short drive away, there is an abundance of museums, art galleries and historical monuments to observe. 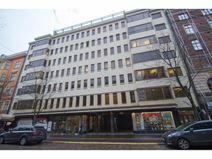 This Helsinki office centre has excellent transport links, with two metro stations within easy walking distance. This is a stylish and comfortable building with light and spacious offices near the centre of Helsinki. In addition, there are postal/mail handling services provided so that your operations can run smoothly with a prestigious presence. It is highly accessible from the E75 road link, along which there is an events venue, Suvilahti. This well situated business centre offers a range of office sizes in a warm corporate environment. Costs are inclusive of main utilities and joint basic amenities. 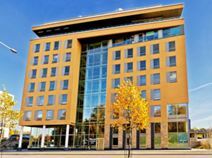 The centre boasts a lovely park view and seaside location, as well as excellent transport links and close proximity to the centre of Helsinki, where there is an abundance of local amenities at which to entertain and impress clients and colleagues. Offices come fully furnished and serviced, with a contemporary and elegant style. Meeting rooms are attached with some office suites, all offered under an all-inclusive price to avoid hidden fees at the end of the month. Given the excellently central location of these working spaces, there are guaranteed public transport links. Plenty of buses and trains pass through the area frequently, with a metro station nearby. Newly refurbished office space ideal for small and medium sized companies. This property has car parking on-site and 24 hour access and is next door to the Itäkeskus shopping centre. You can work through late hours for however long you require with peace of mind. Metro and bus stations are close by as are fast motorway routes to Helsinki and the airport; perfect for businesses with both international and local clients. A pleasant modern centre which offers the choice of large open-plan space or smaller private offices. A wealth of additional facilities are available to tenants including a restaurant with beautiful sea views, a gym and sauna, kitchen facilities, showers and well presented conference rooms. Situated within a business park on the outskirts of the city, there are fast routes by subway, bus and tram to the centre. This centre is easily accessible by car and public transport, and is close to many great restaurants, shops and more. The centre offers a range of workspaces to suit your needs, as well as a selection of business support services. Wireless Internet connection, kitchen and dining area are available for residents. Meeting rooms can be rented separately. Within the immediate area, you can find performing arts theatres, museums and art galleries to observe outside of work. Designed by the famous Finnish architect Alvar Aalto this building has a great city centre location, a 10-minute walk from the main railway station. With high ceilings and large windows, the serviced offices available are airy and light to create a pleasant working atmosphere. This wonderful property offers a number of serviced spaces that can cater to all client needs; ideal for those that want to concentrate without distractions. Set to open its doors soon in Helsinki, this business centre offers a great variety of office spaces in a modern and contemporary building. Professionals can choose from private offices, collaborative co-working areas and easy access to meeting rooms. Offices are bright and spacious, designed to be refreshing and boost your productivity. Membership packages are flexible and affordable. The area is easily reached using public transport options and public car parking options are found nearby. Within an attractive, modern building, the centre boasts spacious open-plan office space, brimming with high quality facilities. These include furnished offices, an on-site restaurant, fitness suite, plus an auditorium available for hire. Around the centre, this is a golf club, a portrait studio, a supermarket and a hotel- making this a prime location in which to host and entertain international contacts. Recently opened, this office provides both co-working and private offices at affordable rates. The space is accessible 24 hours a day making it a flexible working environment and you can come and go as you please. Here, you can also make use of the on-site meeting rooms and the private phone booths. The centre is well lit with both public transport and public parking. There are many cafes, bars and restaurants to make use of on both a day time and an evening. This business centre is found in a fantastic central location. You can benefit not only from a contemporary and modern working space but also an abundance of local amenities found in the neighbourhood. The centre is only a 10-minute walk away and the area has a range of trendy bars, restaurants and cafes. The centre has been recently renovated and benefits from plenty of natural light with large windows and high ceilings. The facilities include conference areas, lounges, communal kitchen and printing facilities. There is bottomless coffee available throughout the day and the centre hosts a range of community events where you can network. These modern and spacious facilities offer plenty of room for business and networking opportunities. The centre offers a range of workspaces including private offices, flexible co-working spaces, meeting rooms for business presentations and workshops. Amenities include high speed broadband and Wi-Fi, allowing you and your business the flexibility to grow. There is an excellent range of bars, cafes and restaurants to choose from during your lunch break, or to enjoy your evening after work. This centre is accessible 24/7, and is housed within a large and charming late 19th century corner building. The bright offices which are fully serviced and with access to meeting rooms conveniently share the building with restaurants and a medical centre. Situated in the midst of the city centre, this is a prestigious business address that will give your business an impressive presence upon occupancy. With views over Töölönlahti bay and a quiet location within easy reach of the amenities of central Helsinki, this property is an ideal business address. The centre is within an attractive early 20th century red brick building with features such as bay windows and stylish reception area but which has been brought fully up to date. It has a pleasant situation by the bay but is also within walking distance of city shops, restaurants and bars. This centre is located in northern Helsinki, with excellent road, bus and tram links. The centre offers a highly desirable business location. Benefits include elegant contemporary stylings, wonderful views and bright, spacious offices. The site is accessible 24/7, and houses beverages, meeting rooms and videoconferencing facilities. There is also IT support on hand to assist in your connectivity through the centre's high speed shared internet. Recently refurbished, airy offices in a modern stone building with exceptional facilities. Leaseholders have use of meeting rooms, a free gym, sauna, an outdoor terrace with stunning views and a luxurious reception area. 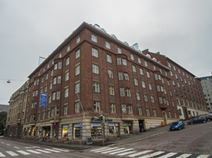 Located to the north of the city centre and minutes from Pasila rail station with excellent transport links. This highly accessible site enjoys an abundance of parks and gardens a short drive away. Located in a highly convenient location, right in the heart of the city of Helsinki, this business space offers a range of working zones including coworking space, meeting rooms and fully equipped private offices. Whether you are looking for a single desk as an entrepreneur or a private office for your team, this space is guaranteed to meet your needs. Workspaces benefit from excellent facilities including business grade wifi, refreshments and printing/copying facilities. The centre also benefits from excellent amenities with buses and trams passing through the area frequently. A modern business centre in a vibrant district of Helsinki, featuring a range of furnished office-spaces available on flexible terms. The space benefits from high-speed internet, spacious meeting rooms, a reception desk and 24-hour access. In addition, the office-spaces can be customised to suit individual business requirements. The area is home to several other commercial entities, as well as being proximate to a wealth of useful services and amenities. Transport links are far-reaching and convenient from this prestigious location as well.